The Duchess of Marlborough Egg, also known as "Pink Serpent Egg", is made of varicolored gold, rose-cut diamonds, pearls and translucent pink and white enamel. 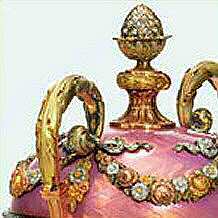 This clock Egg is made in the form of an Easter Egg enameled translucent rose pink over a guilloche ground, the white enamel chapter ring with diamond-set Roman numerals between borders of seed pearls, the top of the Egg applied with varicolored gold floral swags pendent from diamond-set ribbon bows. A diamond-encrusted serpent encircles the Egg, its arrow-form tongue indicating the hour. 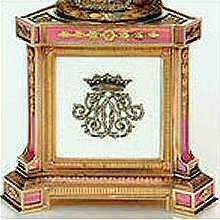 Each side of the trilateral pedestal is enameled translucent oyster over a guilloche ground, one side applied with the diamond-set monogram of Consuelo, Duchess of Marlborough, below a diamond-set ducal coronet, the second side applied with a varicolored gold cornucopia and the third side with a varicolored gold love trophy. The top of the pedestal is enameled translucent oyster with rose pink reserves at the corners, the pilaster corners and the top border of the pedestal are enameled translucent rose pink and applied with gold bellflowers, the lower gold border chased with acanthus leaves, each foot enameled translucent rose pink and applied with a chased gold pattera, marked with Cyrillic initials of "Fabergé" and the assay mark of Yakov Lyapunov (1899-1904), 56 standard for 14 karat gold, also engraved under one foot. the signature in Roman letters, "K. Fabergé", and date "1902". The Duchess of Marlborough Egg retains its original fitted holly wood case, the interior silk lining black-stamped in Cyrillic below the Imperial eagle, "Fabergé, St. Petersburg, Moscow, Odessa". This Egg, the only Easter Egg to have been commissioned from Fabergé by an American, is inspired by a Louis XVI clock with revolving dial. The workshop of Michael Perkhin created several versions of this model, of which the best known is the 1895 Blue Serpent Clock Egg and thought to have been presented by Tsar Alexander III to his wife Tsarina Maria Feodorovna (now in the Collection of the late Prince Albert II of Monaco). As attested by the diamond-set initials "CM" under a crown, the egg was made for Consuelo Marlborough, granddaughter of the American railroad magnate Cornelius Vanderbilt, who was married off against her will to Richard John Spencer-Churchill, 9th Duke of Marlborough, in 1894. She remembered to have dined on "gold and silver plate fashioned by Germain, chased and beautiful in shape and color". After a dinner with Grand Duke and Grand Duchess Vladimir, she was shown the celebrated jewels of the Grand Duchess. She also visited the Dowager Empress at Anchikov Palace and must have seen her Fabergé collection, including the Blue Serpent Clock Egg, which probably served as model for the Egg which she ordered from Fabergé. After her divorce from Marlborough, Consuelo Vanderbilt Balsan donated the Egg to a charity auction in 1926: "an auction of gifts, including a Fabergé clock I brought back from Russia and an automobile brought lively bidding”. The successful bidder was Polish soprano Ganna Walska, second wife of the president and chairman of the board of the International Harvester Company of Chicago, Harold Fowler McCormick. It was later acquired by Malcolm Forbes as his first Easter egg at an auction of her property in 1965 at Parke-Bernet in New York. Michael Perkhin, Fabergé's superbly gifted second head work master, is best known for his objects designed in the Neo-Rococo or Baroque style, of which the Spring Flowers Egg, the Rocaille Egg and are prime examples. Towards the last years of the nineteenth century, a more sober Neo-Classical style made its appearance in Paris. This movement was spearheaded by such great joailliers as Cartier and Chaumet. Fabergé, forever open-minded towards new trends, readily adopted this fashion. In the case of the 1902 Marlborough Egg, Fabergé's Neo-Classical idiom is best seen in the design of the triangular pedestal, the fluted base of the Egg and his use of acanthus foliage, husks, laurel wreaths and flower swags, all derived from Classical Antiquity. Further examples of this new style in Perkhin's oeuvre are the 1895 Imperial Rosebud Egg and the 1904 Kelch Chanticleer Egg.